Tooth fractures are commonly reported emergencies in dental practise. They can vary in severity from a simple enamel fracture to complete avulsion of tooth. Among these injuries, crown-root fractures are considered to be the most common cause of tooth loss.1 They are clinically challenging cases to treat as management of such cases requires a multidisciplinary approach for complete rehabilitation. 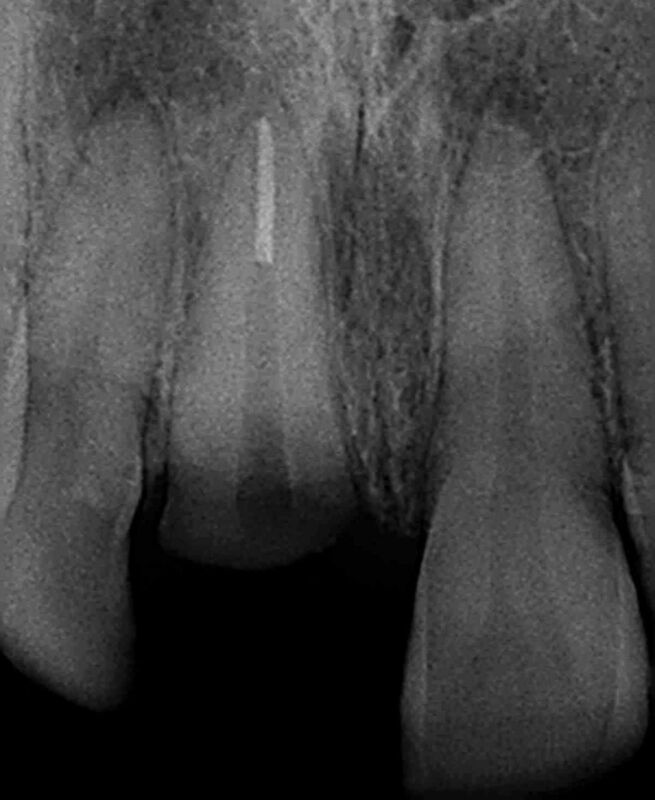 Reattachment of the tooth fragment is the most conservative and biological treatment available in case of crown-root fractures if the fractured tooth fragments are available and reported early in a clean and hydrated state.2 Reattachment can be done with the help of fibre-reinforced posts which provides increased retention of fractured crown segment and is less subjected to root fracture due to adhesive and elastic properties.3 In cases of fractures extending subgingivally, an envelope flap helps to achieve the desired isolation and visibility. This article presents a case report of cervical root fracture treated by reattachment using a fibre post. 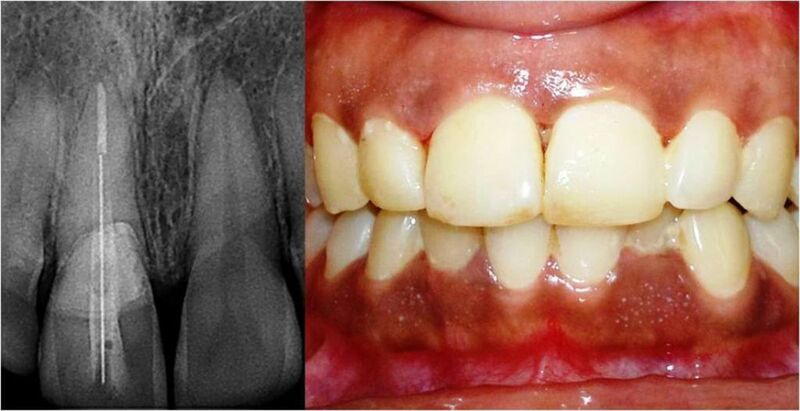 A 25-year-old female patient presented with the chief complaint of pain and mobility in upper front teeth. The patient gave a history of trauma 2 hours back due to a road traffic accident accident. No significant medical history was elicited by the patient. Clinical examination revealed tenderness to percussion in 11 along with Grade II mobility. 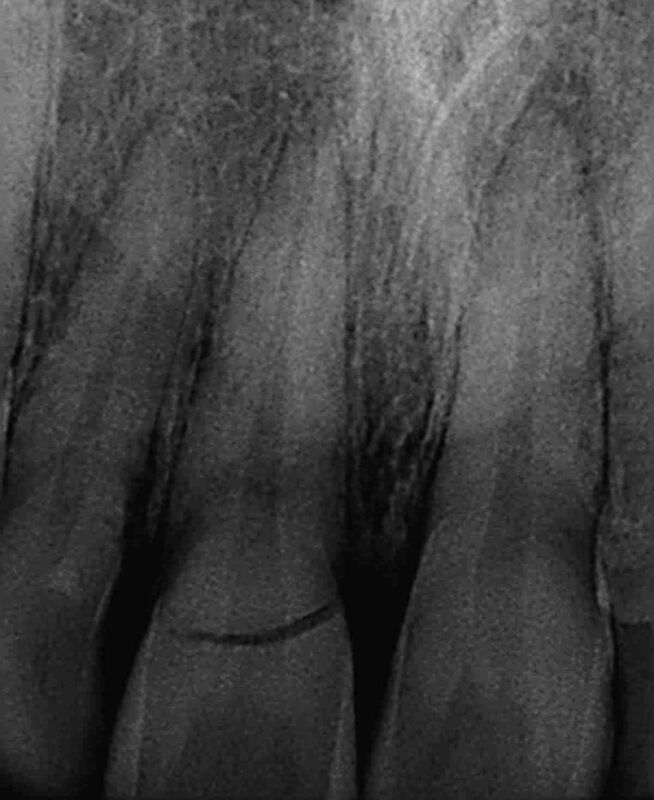 Preoperative radiograph revealed crown-root fracture extending above the alveolar crest of 11 (figure 1). As the fracture fragment was in oral cavity partially attached to gingiva without any signs of dehydration, treatment by reattachment was explained to the patient. The procedure was started after taking consent from the patient. Single-visit root canal treatment was carried out on 11. Post space was prepared using Gates-Glidden drills and peeso reamers (figure 2). A no 3 HiRem quartz fibre post (Over Fibers, Italy) was selected as desired post. As the fracture line was subgingival, isolation of the fracture line during reattachment was not possible. The fractured crown fragment was removed and preserved in normal saline. Mucoperiosteal envelope flap was raised to completely expose the fracture line. In the case as the fracture line was <2 mm below the alveolar bone crest, crown lengthening was performed. This procedure involves removal of 1–2 mm of crestal bone adjacent to the deepest part of the fracture and restoring the normal sulcus depth of 2 mm. Periodontal and osseous recontouring allowed exposure of the fractured margin and sufficient root surface to give an acceptable restorative finish line for positioning the crown fragment in close proximity to root. This in turn maintains the health of periodontal tissues by preventing restorative overhangs caused during bonding procedures. The fractured fragment was prepared on the pulpal aspect to ensure accurate fit over the post. 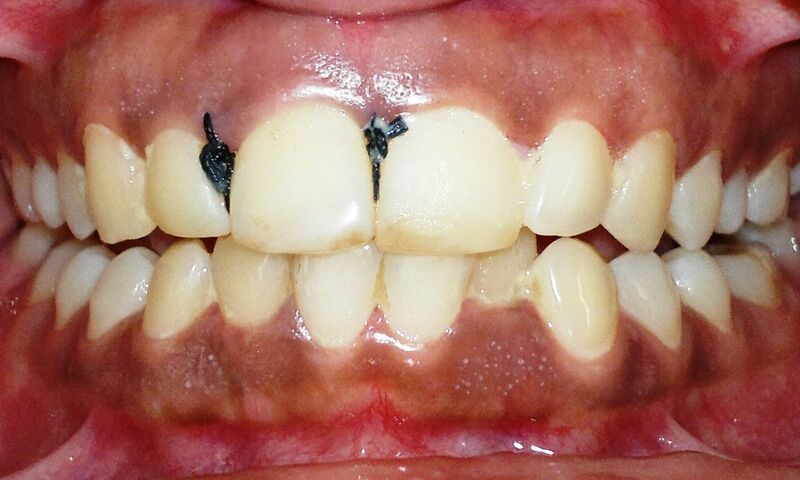 The post and tooth fragment were luted with dual cure resin luting cement (Relyx) (figure 3). The flap was sutured with 000 silk sutures (figure 4). The patient was recalled after 1 week for suture removal. After 1 month the patient was asymptomatic with favourable soft tissue healing and good aesthetics. Radiograph revealed the post-cementation and accuracy of fit of fractured segments without any tenderness (figure 5). Patients are advised regarding the care of teeth that underwent trauma and follow-up at intervals of 6–8 weeks, 4 months, 6 months, 1 year and 5 years. Use of 0.1% chlorhexidine rinse prevents accumulation of plaque and debris and helps in maintaining good oral hygiene. Cases are reported with successful reattachment of fractured fragments with the use of post for augmenting the weakened root avoiding the need for fixed prostheses, implants or extraction. Preoperative radiograph showing fracture of cervical third of root. Prepared pulpal aspect of fractured fragment and cementation. One-month postoperative photograph and radiograph. Pain relief and aesthetic restoration are immediate requirements for traumatised teeth. Reattachment is an economical treatment option to the patient along with positive emotional and psycho-social response. Use of fibre post reinforces the tooth against functional forces.
. Root fractures. Textbook and Color Atlas of Traumatic Injuries to Teeth. Andreasen FM, Andreasen JO. Copenhagen: Blackwell Publishing Ltd, 2007:337–71.
. A conservative approach for the management of a crown-root fracture. Quintessence Int 2006;37:753–9. Contributors NS has done the case. AL and MD have prepared the manuscript. DKS has taken the photographs.